Everybody knows that to succeed in business, you “have to” be on social media. But…how? Which platforms? And how much time should you spend doing it? If you want to make the most of your marketing efforts, you must spend your resources wisely and devise a social media strategy. Find out and derive insight from what customers are saying about you online. Run weekly or monthly automated social media campaigns: Spend just one hour each week or month, and forget about it the rest of the time. Hootsuite is a powerful social dashboard. With it, you can control all of your social media accounts from one place and automate all activity. It has countless options that can help you with social marketing, social listening, and more.I can teach you how to manage all of your social media on Hootsuite, or I can do it for you. 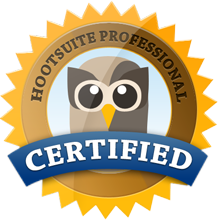 I am a Hootsuite Certified Professional. Read my articles about social media here.